I'm not sure who the audience is for Greenglass House. It's a middle grade novel, but seems geared towards adults who read middle grade novels, rather than actual ten year olds. I was enchanted by the setting. Give me an old hotel with stained glass windows, perched on a hill in a snowstorm. Continue handing out steaming mugs and having the mysterious hotel guests tell each other stories that may involve the history of the smugglers' hotel. Keep me guessing about who is trustworthy. But don't ask my students to do that, because they won't. Milo and his friend Meddy decide to figure out the true background of the guests, but in the guise of a role playing game. Which means that half of the time, they go by the names Negret and Sirin. I guarantee that many of my students would think those were two separate characters. Not a slam on my students, it's just confusing to skip between names, often in the same paragraph. I also don't know many preteens who would persevere through sentences like, "There were three sconces along the wall on each side, and at the far end, a little half-circle-shaped table with a potted white poinsettia on it." 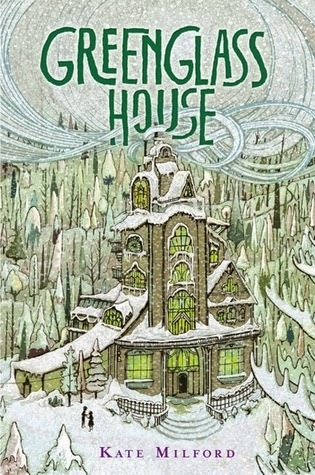 So many of the sentences in Greenglass House were just like that. Curious, I looked up the Lexile for the novel, and it is only 800. But the sentences are long and the vocabulary is complex (puissance, glazier, etc.). Aside from that, it took 100 pages to really get going. I had to force myself to finish. I'm glad I read to the end and learned the truth of the mystery. I don't know any young readers who would do the same.